SWAN enables severely disabled folk to communicate their needs and thoughts to their friends, family and carers. It consists of a smartphone, an electromagnetic interface module, a switch and a pair of headphones. SWAN will enable someone to communicate, who, through disease, injury or approaching death, can't talk, see or write. If they can hear, and are able to make a movement, they can use SWAN to write a word or message. Instead of being trapped, unable to say they're thirsty, or that they love you. The incommunicado. An accident victim, temporarily unable to see, talk or write because of injuries, could use SWAN to give details about the accident. My interest in developing SWAN goes back around twenty years, when my friend's mother was dying of Motor Neuron Disease. His accounts of the increasing difficulty of communication with her were harrowing. Some years later, I became very aware of the need for a communication device when my father and sister each had brief lucid moments during their last days of suffering cancer. I'll never forget the joy I felt, when my questions where answered by a squeeze, or a slight movement, at a stage, so close to death, where it was easy to assume they were comatose. These responses, however, indicated that there was a possibility that they had something to say, but couldn't due to the disease progression and medication. There is a need for a communication device which is simple and easy to learn how to use, as time may be very limited. It should be free, and obtainable in minutes. That's SWAN. A smart phone (which can be obtained very cheaply second hand, or indeed borrowed), running a free "app", speaks the alphabet at a variable rate (selected on set-up by the carer). The user selects letters, either using the smartphone or an external switch, to construct a message. The auditory scanning method of creating a message is very time consuming, but the alternative is no communication at all.... I'm trying to speed up the scanning process , see here. The user could build up a store of messages, or just words, for future use. If the user is unable to use the touch screen of the smartphone for selection, they may be able to use the orientation switch function of SWAN. Here the smartphone is placed on a piece of foam (a pan-scrubber), and the internal accelerometers provide rate of change of orientation data, to detect the user gently pressing on the phone. Those without the dexterity to use the phone's internal sensors for letter selection can use any commercial switch specifically designed for use by the disabled. AAC switches are designed to be used by those with very limited dexterity. They plug into the SWAN electromagnetic interface - a small circuit board which influences the phone's geomagnetic sensor. More on this can be found here. a communicator for non-verbal disabled people. an acronym for SWitch to AlphaNumeric. an auditory scanned alphabet, message creator. 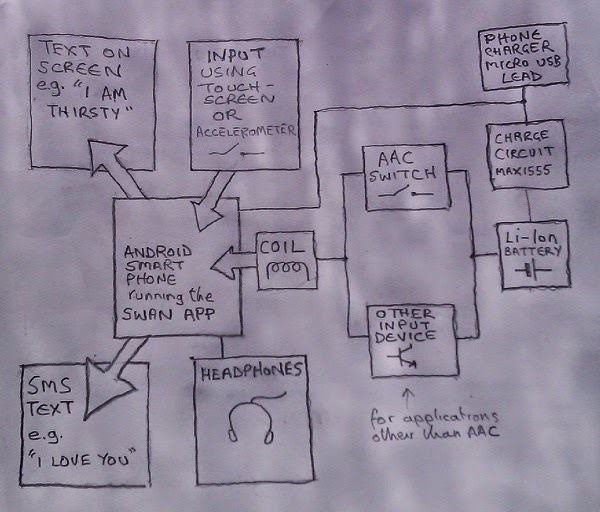 The SWAN electromagnetic interface, being an extremely simple, inexpensive and non-intrusive method of connecting the real world with a smartphone, has uses apart from a communicator, which are detailed here.